From UENO JR-station in Tokyo, take the trains on JOBAN LINE, which are Joban Express train or local train. It will take 75 minutes with the Express train; with the local one it will take approximately 2 hours. 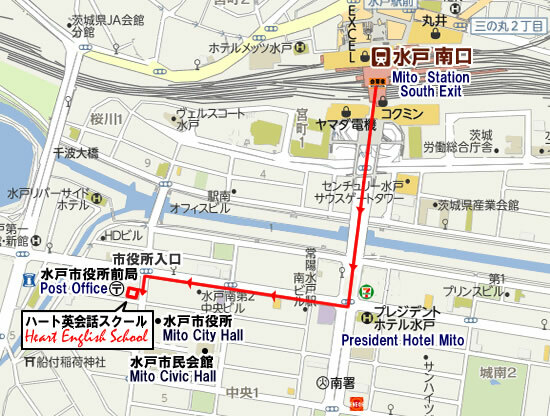 From the Mito station, go to the South exit, proceed ahead over the parking lot (downstairs), go down to the street, and cross the bridge and then make a right turn at the first traffic light. Go straight and make a left at the second light. (The third light is at the large 4-lane bridge). There is Kenshin Bank at the corner. Our office is next to the bank at the 2nd floor. It is a 10-minute walk from the station to get here..